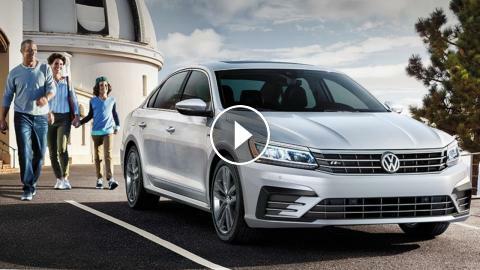 Volkswagen isn't ready to abandon the sedan market in the United States and has a new American-spec 2020 Passat on the way this summer. The latest model rides on the same platform as the previous generation, but VW's designers keep the body looking fresh with lots of little updates. The designers keep the same generation shape for the 2020 Passat's nose (left) versus the 2016 refresh (right). A new grille features even more chrome and dips farther downward due to the addition of a third horizontal bar, rather than two of the previous model. The larger size also creates a more obvious U-shaped element in the front bumper. The lower fascia has mesh spanning the sedan's entire width, which lends a somewhat sporty aesthetic. The profile is where the new Passat changes the least. The silhouette is practically identical, but VW's designers add more chrome to create a more luxurious appearance. The shape of the side quarter window at the back no longer has a slight upward kick. The sharper line accentuates the roof to make the rear look sleeker. The back retains a similar shape, but VW's designers overhaul the details. The taillights are skinnier but more elongated to wrap farther around the sedan's side. A new badge on the trunk lid spells out Passat. New exhaust finishers have a sharp shade and integrate cleanly into the rear than the previous gen's simple round outlets. Similar to the rear, the new Passat's interior is familiar, but there are lots of little changes that keep things looking different. The instrument cluster is roughly the same by featuring a pair of circular gauges and a screen between them, and there are only tiny styling alterations to the steering wheel. However, the dashboard now features trim that makes the HVAC vents initially appear to span the cabin's entire width, and the previous gen's analog clock is gone. The center stack has the same general layout but with a larger infotainment display. 2019 Nissan Altima AWD Sedan - Volkswagen Passat Killer?